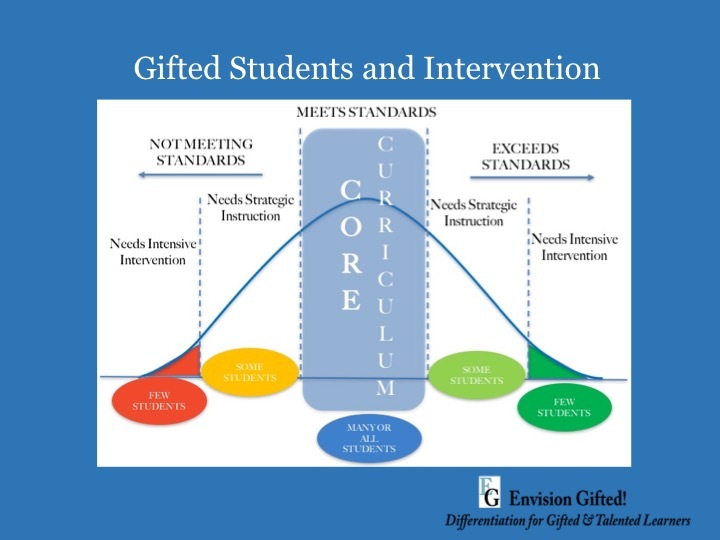 Why Would Gifted Students Need Specialized Instruction? The simple answer is that gifted students have special learning needs that are difficult to meet without some sort of intervention. Sadly, there are still people who have the misconception that gifted students “will be fine” and don’t need specialized instruction. “After all, they are smart!” “They don’t really need anything from me.” “The kids that really need me are those who can’t (read at grade level, are below mastery in ____ standard, etc)”. Nothing could be further from the truth and yet, we’ve all heard this reasoning before. This line of thought isn’t surprising given the focus on ensuring all students make growth toward/meet the standards. In fact, many of us educators went into this profession to help those struggling students. It’s not that people who believe this line of thought are bad, it just means they don’t understand. These teachers often give their students busy work, allow them to be their personal assistant, act as a aide to students to don’t understand, read a novel when they finish classwork and the like. The truth is, gifted students do struggle. The problem is, they are really good at hiding it, and their struggle is often invisible until it reaches a critical point. Gifted students need intervention. As teachers of gifted you are in a prime position to help those who don’t understand. Gifted students require specialized instruction and differentiation. This graphic shows how most students land right in the middle of the bell curve. These students are quite appropriately challenged through the core curriculum. This also shows quite clearly that students on the outer reaches of the bell curve are those who need, and are entitled to, intense intervention. The dark green (far right of bell curve ) represents gifted students. The red (far left) represents those students who are often served through an IEP or with special education services. Either way, students at the extremes must be served by specially trained teachers. Classes must be created strategically to best meet the needs of the students. Teachers cannot appropriately meet the unique needs of students on both ends of the spectrum. This should be taken into account when creating classes. To be clear, there are twice exceptional students. Gifted students who also have a learning disability should be placed appropriately and not be denied access to a gifted program. Susan Winebrenner has written extensively on cluster grouping and ways to meet the needs of gifted students. Be sure to check out her website for more information.